Perry the Corpse Flower’s leaf has begun to unfurl! The massive leaf shoot, growing by many inches per day for the past few weeks, has begun to open its leaflets to the sun. What follows will be Perry’s gulping of light to feed the massive corm that lies within the pot, all to power yet another titanic flowering. 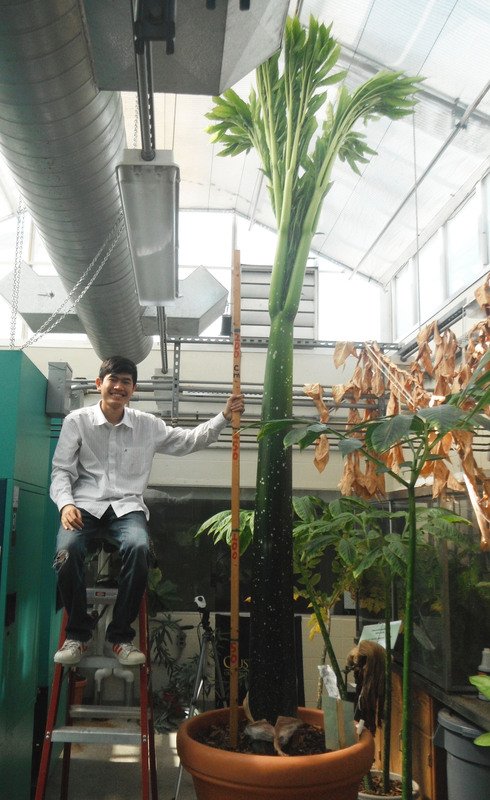 Perry (aka Amorphophallus titanum) produced an unusually large inflorescence last July, followed by production of seeds. We had been wondering whether or not Perry would even survive seed production, much less produce another leaf for another life cycle. Perry has answered the question in a spectacular way – this leaf looks to me to be about the same size as the last one, or is it bigger…? Today Tuan and I measured it at 137 inches tall, and 30 inches in circumference at the base. Take a look at the Perry Webcam (running since 2007, and now in a great spot!) 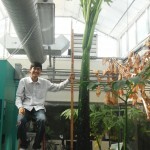 to keep up with the magnificence of unfurling of this gargantuan botanical umbrella!